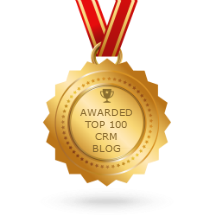 SugarCRM is intrinsically very powerful tool. However, it may become even more efficient when properly customized. So, we proceed with our topic of SugarCRM customization, and today’s article is aimed at SugarCRM administrators. 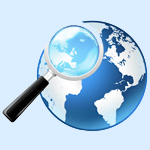 It provides the necessary concept of how the operation of the Global Search mechanism is arranged. It also constitutes the instruction for setting up the quick search prior to its first launch. The material presented in this article assumes that you already have an installed SugarCRM product, an expanded ElasticSearch, and an account with administrative access. In this window, find «Full Text Search Settings» section (Figure 1) at the bottom of the page. The first thing you need to pay attention to is whether the fields «Host» and «Port» are filled. where the values of “localhost” and “9200” should be replaced by your own. After modifying config_override.php file, there is no need run «Quick Repair and Rebuild» operation. The values will be uploaded in «Full Text Search Settings» form automatically after reloading the page. Here, at the top of the screen, we have 2 columns: Enabled Modules and Disabled Modules – Included and Excluded GP modules, respectively (Figure 3). The task is to leave only those modules in Enabled Modules column on which the search will be performed in your system. 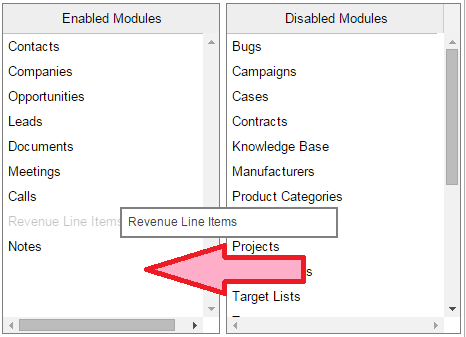 You can do it by dragging the modules from one column to another. After adjusting Enabled Modules list, remember to save your changes by clicking «Save» button (Figure 4). It is worth mentioning that the search will be performed only on the fields of the module in which the corresponding attribute is set. You can add a field into the search either with the help of Studio or manually by adding a code to variable definitions module section. While displaying the results of the search, the field with a higher priority will have an advantage, i.e. the found entry will be listed higher. When changing the priority of the field, readjustment of the system is necessary for amendments to take effect. where [Module] is the application block containing the field. In this example, we include «twitter» field from Contacts application block in the GS. 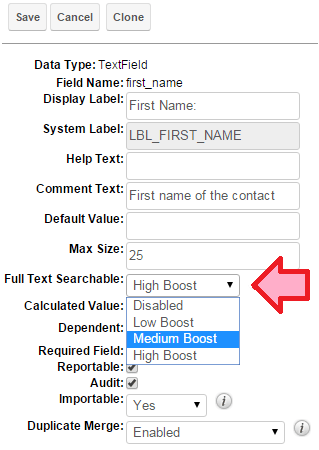 The value of «boost» parameter lies within the range [1..3], where 1 is a low priority, and 3 is a high priority. After these manipulations, you have to reset rights to the file / directory (if you created it) and run «Quick Repair and Rebuild» operation. This article will consider both approaches. The main difference between them is that the first approach presupposes that the full indexing of the system should be performed once, whereas the second one guarantees the full indexing of the system only after a set period of time. and in each of the tasks, check the property of «Job» (Figure 6). If there are such tasks, they should be turned off for some time (enter Status = «Inactive»). At this stage, we check whether there are some records in fts_queue table. If there are some, they should be deleted. This table stores the records that are in the queue for indexing by the ES server. Since we are running a full index of the system, there should be no records in fts_queue table. Now we check whether there are records in job_queue table, which fall under «WHERE» condition from the query below. If there are some, they should be deleted. This table stores completed and pending tasks of the Scheduler. There will be as many such records as there are application blocks of the system involved in the GS. Since we are running an initial index there should be no such tasks. It is also worth mentioning that each of the tasks of the GS Scheduler can have either status «queued» when pending, or status «running» when executed. This ensures that the GS index remains up-to-date. where 25,000 is the size of the pack of records. So, the final preparations are made, and we can launch an index. To start an index, click «Schedule System Index» button (Figure 7). Next, confirm that you want to perform a full system index (Figure 8). 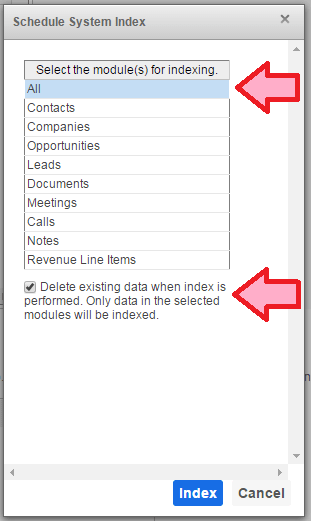 At the next step, you need to select the modules for which an index is performed. In our case – all of them (All). Also, it is necessary to put a tick (there is only one in the box). This will tell the system that we want to remove the old index and create a new one (Fig. 9). Upon making settings, press «Index» button. The system will notify that the main task of the Scheduler for performing an index has been created and will be launched soon (Figure 10). It is this task that will create the children when performed (those, the names of which begin with «FTSConsumer»). They, in turn, will begin processing records for each application block separately. Also, our main task will fill the queue for indexing (fts_queue table), which consists of all the modules of non-deleted records involved in the GS. Select Create Scheduler in SugarScheduler menu. On the newly opened form fill Job Name with an arbitrary name (for example, «Global Search»), and in the drop-down list of Job field select «Full-text Search Index System». Also, remember to check Status box that should have «Active» value (Figure 11). Utmost attention should be paid to Interval field. Launch frequency of the task should be set to a fairly long period of time (for example, once a week). This is due to the fact that if repeated frequently (once every 2 hours) the system will not have enough time to index all the records. Figure 11 demonstrates that the Task Scheduler is set to launch every 6 days at 18:00. When the adjustment is completed, press «Save» button. The task will be launched according to the schedule. fts_queue table is filled with all the records from all application blocks, on which the global search is performed. The Scheduler’s tasks of indexing the records from each application block are run in turns indexing the records of their module in packs of N records each. After an indexing procedure, the corresponding records are deleted from fts_queue table. When each record is saved in the application block, involved in the GS, it falls within fts_queue table as a new record. The next time you launch the appropriate task of the Scheduler, it will be indexed. Our SugarCRM customization is done. We’ve described the basic concepts of Global Search operating mechanism in SugarCRM. Also, a detailed instruction for setting up this mechanism prior to its first launch was provided. Good luck! Below you’ll find our contact form – use it in case if you have any questions on how to customize SugarCRM. We’ll be glad to help you!